TORONTO, September 12, 2018 – Collins Barrow, one of Canada’s most well-known accounting brands, is set to announce expansion plans and a new vision for Canada's largest network of independent audit, accounting, tax and advisory firms. 2020 Vision will be championed by Grant Galbraith, FCPA, FCA, the new chair of the board of directors, Collins Barrow National Cooperative. "Collins Barrow has a uniquely Canadian history,” says Galbraith. “With deep roots in local markets, a philosophy of transnational collaboration and strong global connections, we're proud to be the true mid-market alternative for clients seeking exceptional value, entrepreneurial firms motivated by membership in a progressive network and top talent seeking a rewarding and challenging career." Galbraith will present the 2020 Vision to Collins Barrow partners from across Canada at "The Future is Now! ", a partners’ conference to be held in Chicago from September 20-24, 2018. The network recently announced that firms in Vancouver, Toronto and across Southwestern Ontario are set to join Collins Barrow before years end. Firms and location details will be announced through September and October. "Firms who are interested in joining the network must share our intrepid and driven mindset, which has made Collins Barrow the trusted Canadian alternative for accounting, tax and business advisory support," says Ken Tammadge, FCPA, FCA, who leads firm recruitment at Collins Barrow National. "Launching unique specialty services is a hallmark element of our strategy for growth and client success — one we're eager to expand with new firms in new markets." Collins Barrow comprises 48 offices across Canada and 1250 professionals offering clients a diverse array of financial and speciality services. The cooperative network is the Canadian representative of Baker Tilly International. While maintaining its independent structure, Collins Barrow accesses experts and firms in 147 countries globally. By Canadian Accountant staff. With files provided by Collins Barrow National. 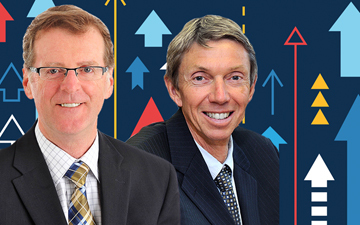 Pictured from left to right, Grant Galbraith, chair, board of directors; and Ken Tammadge, Tax Partner with Collins Barrow Ottawa LLP.